The company behind the latest extended-range black cab, LEVC (London Electric Vehicle Company), has announced that it is due to start trials with potential customers of its new electric van in London next year. The Coventry-based manufacturer is currently in discussion with a number of major public-sector fleets about trialling prototype vehicles, including the Metropolitan Police and London Fire Brigade – both of which have ambitious programmes to reduce fleet emissions, with a target for all new vans being zero-emission capable from 2025. 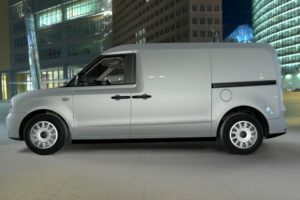 Earlier this year, LEVC announced that it would be entering the van market with a zero-emission capable delivery vehicle. The LEVC van combines 70 years of knowledge of designing vehicles for city streets with a proven electric vehicle powertrain. The van will share the platform – and legendary turning circle – of a London taxi. Like the taxi, the van will combine a fully electric powertrain with a petrol range-extender. Unlike many electric vans, the LEVC vehicle is intended for long range as well as urban deliveries, travelling over 100 miles a day. This is a segment currently dominated by medium sized vans, with pure EVs focused on urban work. Other key features of the van will include safety systems using semi-autonomous software, while the van is also required to meet LEVC’s million-mile TaxiDur test – one the most stringent vehicle durability testing regimes, designed for vehicles that spend an entire lifetime in service.